Oryginal article (in Polish) you will find here: Jakie buty wybrać w góry? Od trekkingu po alpinizm. 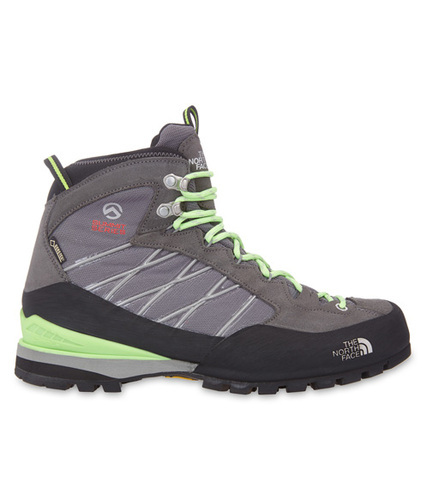 Do you need shoes for mountain hiking in the small Mountains, or maybe the alpine type of mountain? At stake only hiking in the summer, do you take into account the winter? In the past climber/hikers usually have shoes for everything, but currently on the market will find dozens of types of shoes for special purpose. They will be climbing shoes for a day, approach shoes, boots for multi-climbing, etc. Fortunately, you can also find universal designs that make in many areas, summer, and winter. Here we go then. I will begin by discussing the kinds of shoes intended for summer and winter. In the end, you will find a link to an article with tips for buyers typical mountain boots. What kind of shoes to the mountains in the summer? If you do not walk in difficult terrain (a lot of stones/boulders), but you adjust to the mild, day trips into (not) alpine mountains, but just hiking, then perhaps a better (and certainly cheaper) option will be for you shoes with softer soles, providing better grip than shoes with hard (vibram) soles. But if you think about something more then read on;). The times when mountain shoes were heavy are gone. Currently we recommend comfortable, lightweight, as rigid shoes with rubber tips. These shoes will be suitable for approach, landing and easy climbing (for example: ridges, easy climbing routes). 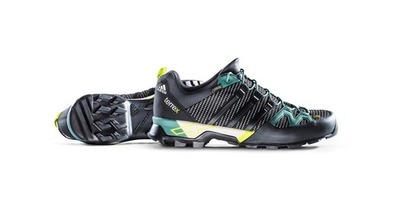 Very good shoes in this area are: adidas Terrex Solo, or adidas Terrex Scope. This kind of shoes must be comfortable. 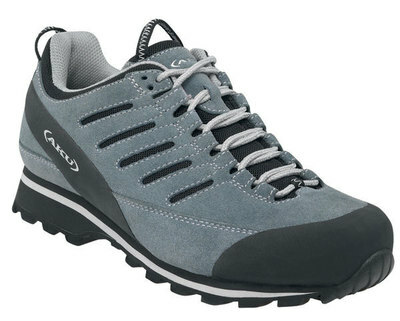 Approach shoes tend to have a harder sole than typical city shoes and usually are better in difficult mountain terrain. Of course, when we walk through the wet grass, snow shoes so get wet. The point is not that they are not waterproof, but rather water gets into the top of the shoe. When I use these mountaineering shoes? During the one-several-day tours in spring, summer and autumn. I'm going as far as to lightly (10-12 kilograms). They usually approach the climbing routes, day trips, mountaineering, approach the rocks and, of course, on a daily basis in the city.. Perfect for a multi-day hiking trip. Also good factor is the temperature. Where would be boiling hot, and the area would not be suitable on the sandals that shoes. For example - Aku shoes Rock Lite II GTX is a pretty good model. I use them for a few years and appreciate them. Each company has its own "best seller". Check them in the shop and see if you do not feel chafing heels. Rather, ankle boots would decide on the long trekkings in difficult terrain and with a heavy backpack. This where we have to go outside routes, often in mud, gravel, on scree, moraines glaciers. In short, where 80% of the readers of this article will not go :-). However, if you're in the minority and you are natural born hiker then ankle boots are for you ;). 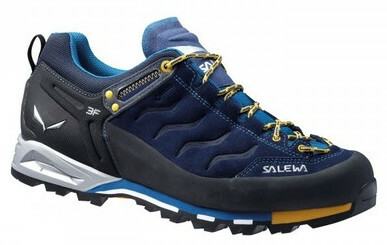 But the "speed hiking" - Salewa Speed Ascent. Speed hiking in the assumption discipline, during which a given route overcome rapid march. For this, we have with each other trekking poles and actively use them. Generally they are light and flexible shoes that allow you to easily and conveniently travel a given route. At this point, I have no practical experience. Something I read on the internet / press, so I would like this issue only roughly closer. Think of it all as a theory, and look for more specific information on other sites or among friends. Definitely lightweight shoes (max 350 grams) with a good tread on the sole. The shoes designed for mountain gear maneuverability is important. You will probably want them at the same time run / walk tens of kilometers. Add to that more often wet conditions, mud, sand, etc., and you get a lot of factors that will be happy to massacre your feet. 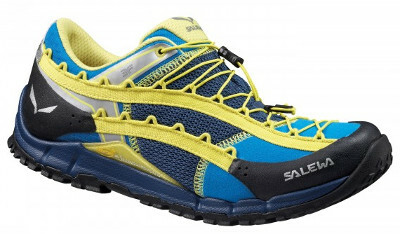 Companies recommendable when mountain running is available: Solomon LaSportiva, The North Face. 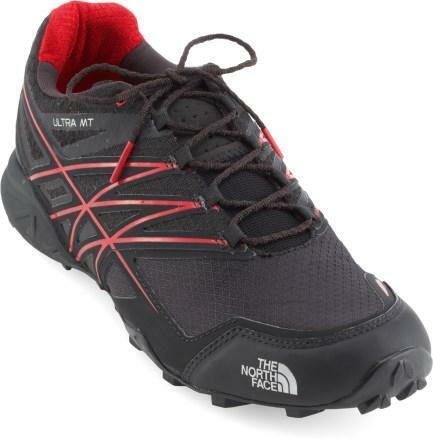 Trail shoe The North Face Ultra MT. 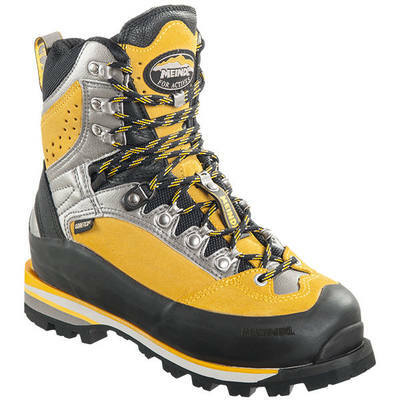 Description Manufacturer: top boots and cross trail. They withstand the harshest conditions. They provide unmatched traction and control with the new Vibram sole Megagrip. A special system of strategically placed upper layers increases support for the arch, protects fingers through tightly woven reticulum and breathability thanks to the Ultra Airmesh material. ESS provides uniform distribution of energy during the forefoot strikes the ground. Megagrip Vibram outsole provides unsurpassed traction and control. The tread on the sole keep well in the mud, wet stones, sand, etc .. On the market there are models with varying degrees of "hardness". You will find the shoes quite stiff, supportive muscles of our legs during a long run. On the other side, you will find the so-called models. Natural run. Quite soft and requiring the runner a habit. Gore-Tex? Probably not needed. During the off-road gear, you ran across the grass, mud, jump jets (or pass). In most cases, water enters from the top and your concern will be how to pour the water out of boots. Immediately warn that in the summer do not go in these boots after the Beskidy Tatras. Currently, my set of footwear is approach shoes, two pairs of shoes high altitude (single and dual layer) and skitour shoes for ski touring (the Tatras, the Alps and Beskidy). Boots do not protect against internal injuries hocks, but rather against mechanical damage. Trekking shoes Ankle definitely recommend for trips, expeditions for people who are going eg. In Georgia and want to go on Kazbek, but they will also walk the surrounding mountains below the snow line. So we need to have sturdy shoes, on relatively stiff soles which will attach crampons basket in case. On the other hand shoe as light and allows wandering more easily (and warmer) area. I must admit that these shoes are pretty universal. They are as light and strong. We go out in them for simple tops even in the winter (the possibility buckles carcinomas). If you are suitable for winter hiking in the Beskidy Mountains and the Tatra Mountains. In conclusion, it may be beneficial to purchase for people who need a versatile shoe as both the summer and - to the extent easy - winter. I am thinking of easy trekking peaks. Winter climbing is rather difficult. Trekking shoes sometimes in one day encounter a series of conditions: rain, mud, snow, ice, gravel, wet grass, scree, etc. They have to be robust. At stake here shoe leather or leather-cloth duo. The Classical leather shoe is characterized in that it is the relatively high and rigid uppers your ankles, solid lacing system, a high language. Aku Tribute GTX is a classic shoe leather ankle. 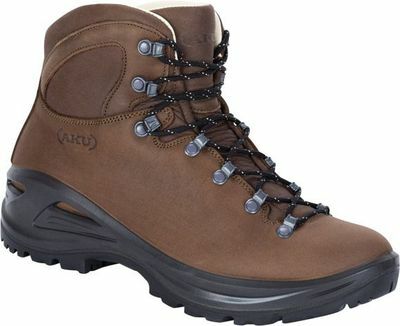 Description manufacturer: trekking boots made entirely of leather, reinforced GORE-TEX® Performance Comfort - have a high resistance to mechanical damage. Equipped with a stable and well damped Vibram sole, through which shoes retain grip on variable surfaces. Perfectly suited to the mountainous terrain moderate, they cope even in winter conditions - with the exception of very low temperatures, which are not insulated additionally. Technological advances have meant that appeared on the market shoe leather and fabric. Compared to the leather are lighter, more comfortable, dry quickly and are less expensive. Often, however, they will be less durable. 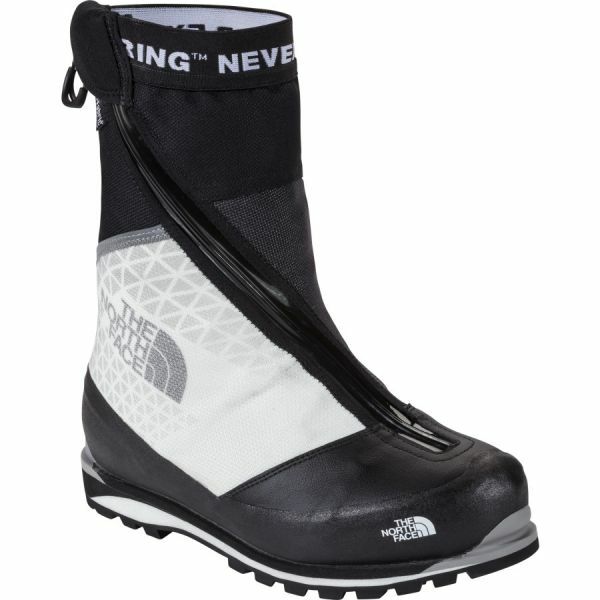 Probably it will be less water resistance (unless you have an inner layer of Goretex). The North Face shoes S3K GTX, which is another shoe for a piece of Summit Series family - a pair of size 42 weighs 1164 grams. Manufacturer Description: In his name, as was the case presented in recent years S4K, or S6K (see test) were coded indication as to the amount and thus the conditions for which it was designed. This time, we are dealing with a model for climbing the peaks height of about 3,000 meters (3K). It uses a waterproof and breathable Gore-Tex membrane, known from the above mentioned models insert Northotic Pro +, OrthoLite lining and TPU Cradle stabilization technology. Sole Vibram is harder in and around the toes. The so-called. "Climbing Zone" allows some stand on small steps. Suitable finish around the heel turn allows the installation of semi-automatic crampons. High sewn into + is ideal if the shoe is connected to prevent ingress of water. Rubber rant, increases water resistance and durability. Deep lacing and locking system shoelaces. Here everything depends on the climbing route. If you intend to go on 10 exhaust path that is a lot of easy terrain and we have a store, it's best to take comfortable shoes, slippers may be that we use on the panel. Especially when most of the time we went to another. If you are going to go the difficult way for us, the shoes should be tighter, but without exaggeration. Ideally suited in the mountains laced boots, which also good "sit" in features and other strange formations where we katowałyby shoes asymmetrical foot. 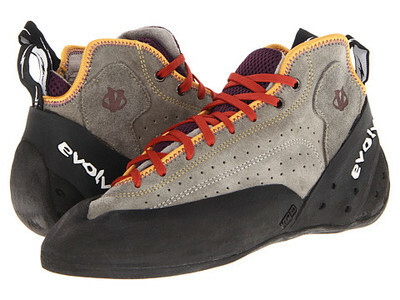 Sample (Evolv Astroman designed by Peter Croft) shoes dedicated to all-day climbing in the mountains. Lace, leather, holes for better air circulation. But with a comfortable lining material. In addition, what it is now a rather rare in our European market, but has a high upper to protect the ankle. This is to protect the interest of features that in the United States dominate. What kind of mountain boots for winter? In fact, one of the most important pieces of equipment. Definitely better not save (too much) on shoes, which are typically a big expense. The obligation to remember the truism that shoes should be above all comfortable (no chafing heels, etc.) And warm (under the circumstances). Remember that the best person to try on the model and better cautiously buys on the Internet. Of course, everything depends on what activities need shoes. To hiking in the mountains where we walk in the mountains glacial type will suffice duo leather shoes or leather-synthetic fabric + Goretex. Ideally, if they have to fasten the automatic crampons and weigh so to 1.2-1.4 kilograms (pair). In the end, however, can be ankle boots, which will attach crampons strip - for easier trips, eg. Winter in the Alps. However, remember that appetite grows with eating, so you may want to invest immediately in the shoes of the semi-automatic crampons. Hiking on skis, which are intended ski-tour boots, ski boots or modified with moving parts to long march. Skituring is a great alternative to walking in winter in the mountains. Because up approach to ski comfortably and down go down. We are much faster and be less tired. I sincerely recommend you try. Day of winter climbing to be enough leather (with elements of artificial fabrics) shoes, but allow automatic crampons - sole in them should be very stiff. A pair of these shoes as best he weighs up to 2 kg (size 42). But it must be sustainable, because climbing is quite a big challenge for our equipment. 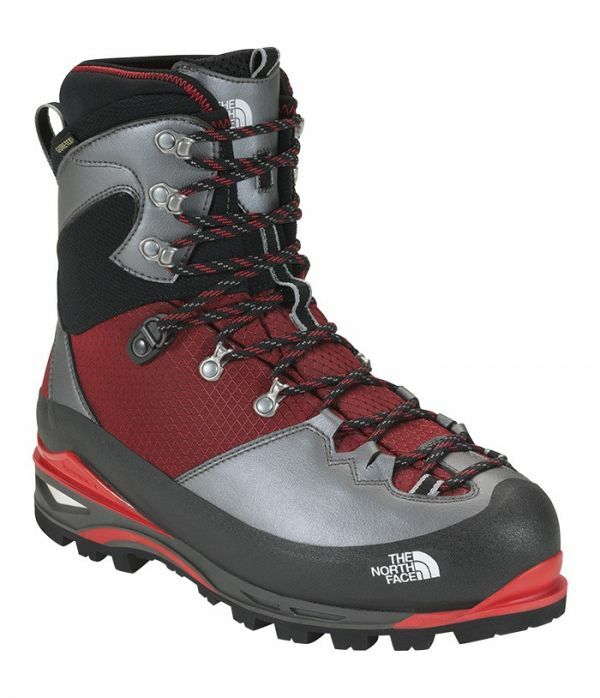 Boots The North Face Verto S6K Glacier GTX made for mountaineering, climbing mixt and ice. Here are their description and test. 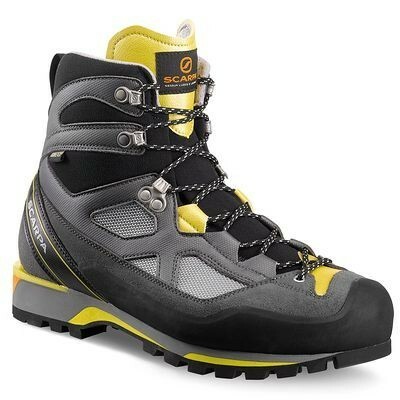 Single-layer boots - the automatic crampons - Piz Palu Meindl Lady GTX. 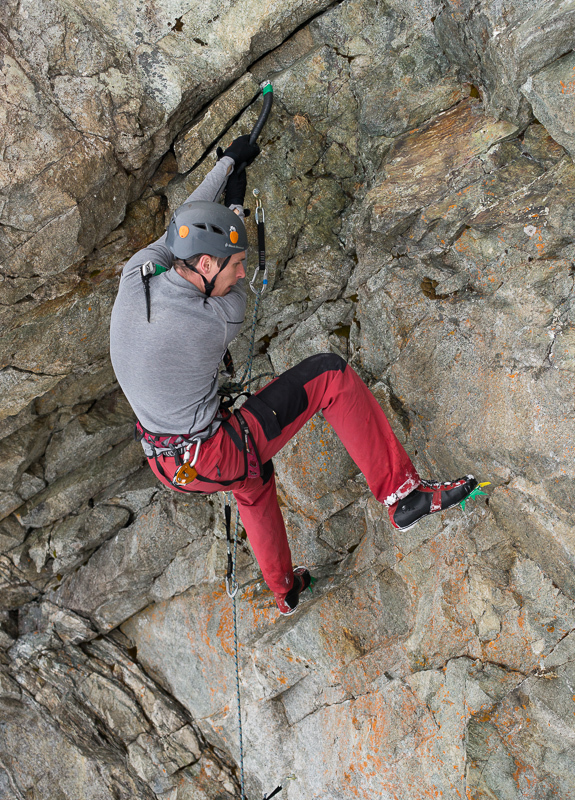 To dry tooling on easy roads, an average of tough (vertical, slightly overhanging), which is generally M7 + will suffice us monolayer shoes with buckles on automatic crampons. Strong competitors will be able to do them even greater number. I witnessed how difficult fell as M10 +, so, in general, it all depends on the store :). Dry tooling to the difficult but invented a special fruit boots that resemble some climbing boots with crampons bolted. It is a very specialized shoes that I recommend to the road above the M7 +. As the Polish market is very small, and even the price of new fruit boots hovered around 200 dollars and more in line with the "Pole can do" a lot of people did himself fruit boots or commissioned it to specialists. I encourage you to read this text: fruit boots - test- how to do (in polish). Mountain climbing for several days now we will need more specialized shoes. It is assumed that it will be used a few days in a row without the possibility of drying and, therefore, should have internal pull-out gaiters. The most modern models have a gaiter, which is an additional protection - no need then also wear stuptuts and are more resistant to water. Ideally, if the couple will weigh in the range of 2-2,2 kilograms (size 42). Historically, this segment dominated by a plastic shell with pull-out boots. Now, however, these shoes are a mix of plastic material, leather and, if necessary. Plastic. Although there are still an outstanding plastic shell, so if you have limited financial resources, healthy knees, and we want to - very - Loic alpine terrain, you possibly can think of a shell. For ambitious mountaineering expeditions (7000 m above sea level, or winter expeditions to the mountains 4000-7000 m above sea level) we need special shoes. They are very well insulated, they have drawn boots and outer over both (to the knee, sometimes even insulated foam). 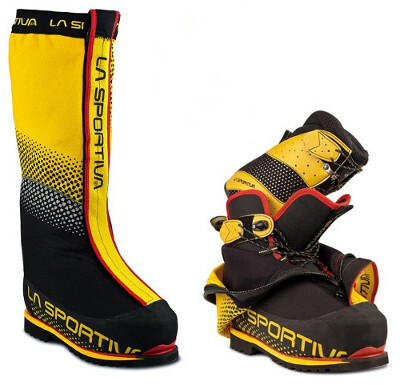 Shoes La Sportiva Olympus Mons Evo dedicated at an altitude of approx. 8000 meters. A characteristic feature of the appearance is very high Getra to prevent the ingress of snow and insulation from the cold. Warming is there really a lot. Botek interior can be removed and walk in it in a tent.